It's finally happening. I am finally finding some spare time to cook. And to write! I have even purchased a few books in the past few days - am I actually going to be able to read this summer!? I shouldn't push my luck quite yet, but I have to say, it feels pretty nice! For as often as I complain about living at home...trust me, if you find yourself at the ripe young age of 25 still living with your parents, you will find plenty to complain about...this does have a few perks. My parents are game to try just about anything that I put in front of them! This even includes vegetarian meals - something my father would have NEVER tried before I started SMAK. I have guinea pigs. People to try the many recipes that I fall upon. Best of all? They have to eat as well, so more often than not, I don't find myself emptying my pockets to pay for dinner. Thank you Scott & Carla. I like fish 99% of the time. Most people who do not eat fish tell me that it tastes too fishy. Guess what genius - it's FISH! All joking aside, if you feel this way, I do understand. Some fish can have a rather potent taste. The nice thing about this recipe is that there are so many other flavors that compliment the salmon. You don't have to be afraid of being slapped in the face with fish. This sandwich is messy. I am not going to lie because to be quite frank, it annoyed me. If you go into this meal with the expectation that things may get a bit messy, you'll be golden! Plus, it is so delicious that nothing else really matters! Things have really been turning around lately and it makes me very excited! The weather today?! Let's just say that I drove home with my windows down and music blaring! With new weather comes new recipes! So until next time...happy eating! Meanwhile, prepare the guacamole. Place the avocados, lime juice, scallions, red onion, jalapeño pepper, garlic, 1 teaspoon salt, and 1/2 teaspoon pepper in a mixing bowl and mash roughly together with a fork. Taste for seasoning; it should be very highly seasoned. Set aside. When the bacon is done, heat a dry cast-iron skillet over high heat for 5 minutes. Pat the salmon filets dry with paper towels, brush them all over - top and bottom - with olive oil, and sprinkle generously with salt and pepper. Place the filets in the skillet skin side up and allow them to cook without disturbing them for 2 minutes exactly. With a metal spatula, carefully turn the filets and cook for 2 more minutes. Transfer the skillet to the oven for 2 minutes (time it carefully!). Remove the salmon to a plate and cover it tightly with aluminum foil. Allow it to rest for 10 minutes. While the salmon rests, cut the ciabatta rolls in half crosswise, place them cut side up on a sheet pan, and toast in the oven for 5 to 10 minutes, until lightly toasted. 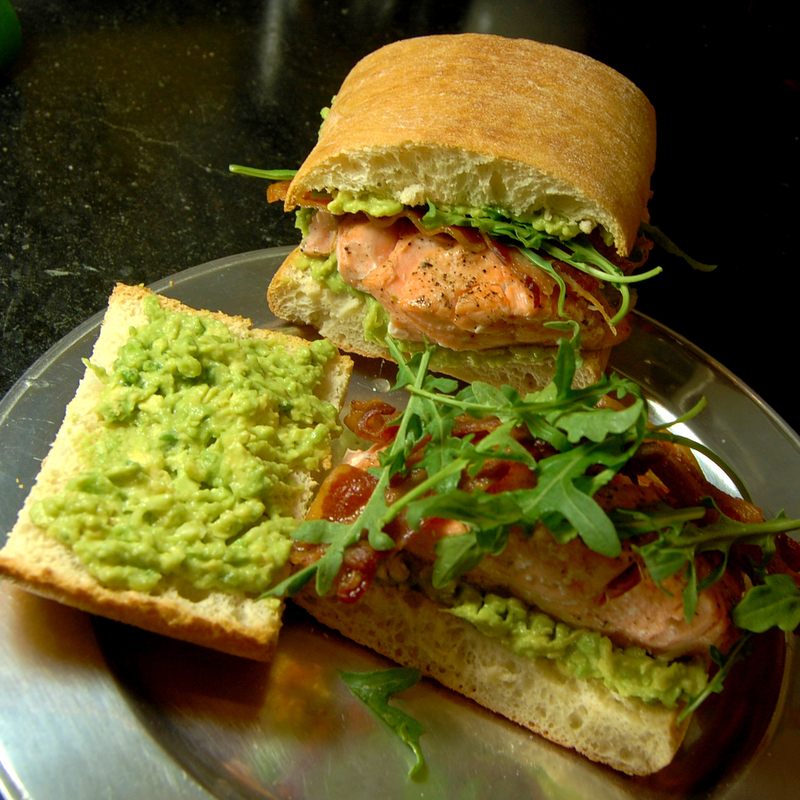 To assemble the sandwiches, place the bottoms of the ciabatta rolls on a board and spread each with 2 rounded tablespoons of guacamole. Remove the skin from the salmon filets, cut each filet in half crosswise, and place both halves on top of the guacamole. Add 2 slices of bacon, a handful of arugula, and a sprinkling of salt. Spread another rounded tablespoon of guacamole on the underside of the top bread and place on top. Continue arranging all the sandwiches. Cut each sandwich in half diagonally and serve warm or at room temperature.